The fiftieth birthday of Wolfgang Rihm, possibly the finest living German composer, has gone unremarked in this country. A retrospective such as the extremely interesting one I recently saw in Madrid would have been most valuable as he is a very fine composer, one that in these years when contemporary classical music has lost confidence in itself carries a torch for serious, ambitious music. As the violin concerto he wrote for Anne-Sophie Mutter shows, his music is extremely busy, and certainly cerebral, yet it is exceptionally expressive, much more so than opponents of "modern" compositions would believe. Cutting a swathe through the repetitive, pastoral mush that passes for new music, could this be the acceptable face of the Boulez school of composition? Like Boulez, Rihm continually works on pieces, often declining to consider them "finished". 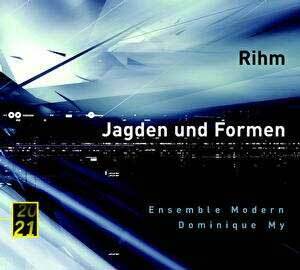 The piece on this disc, Jagden und Formen ("Hunts and Forms") is a superimposition of at least three existing pieces, and is the third version of the piece, premiered in November 2001 (after the recording of this disc). It is an extremely episodic work, and the hunt of the title seems to be a hunt for form, which in itself becomes the form. It is obvious from the first listen that there are some extremely intelligent musical procedures here � for example in the contrast between the planes of quickly moving themes in the foreground and more slowly evolving ones in the background, in the manner of Elliot Carter. Written for a wind and percussion dominated chamber orchestra, the timbres are also extremely interesting, both superficially � from the out of phase violins at the beginning to the combination of contrabassoon and contra-bass clarinet at the end � and more deeply, where the shifting emphasis between groups of instruments highlights the "hunt." Special mention must also go to the stratospherically high bass tuba solo (played by Jozsef Juhasz), in which the effort is presumably part of the effect. All this is very well, but it is brought to life only by the stupendous playing of the Ensemble Modern. Many passages here are virtuosically difficult, but they are all executed with polish and a whole-hearted gusto that makes the piece fly. Dominique My imposes a perfect clarity on the performance, so that every detail (faithfully recorded) is given its proper place. This is above all an explosively dramatic and expressive piece, and the musicians deserve the highest praise for making it so. This is a fascinating work, given an exemplary performance. Nobody with interest in music as an intelligent pursuit will be disappointed in it � very highly recommended.